24 hour emergency dentists are a necessity for each and every region, in every corner of the world. Not only are they approachable for any toothaches that start up late into the night, they also see to the servicing of knocked out teeth. While some cases could wait till the normal visiting hours of a dentist’s chamber, other cases call for instant medical attention. In such situations, if there is a lack of emergency dentists, the patient’s condition may worsen. Filled to the brim with at least 110,000 people, Inglewood came into existence somewhere around the late 1880s. One of the most interesting facts about Inglewood is that it happens to be just minutes away from the Pacific Ocean. This gives the population of Inglewood the chance to drop by the shore to get a taste of some water skiing.The LAX Firing Range, The Centinela Adobe Complex and The Forum are just some of the attraction sites of this California-based area. There are a number of dentists and dental care units around Inglewood, a few of which have been described as follows. 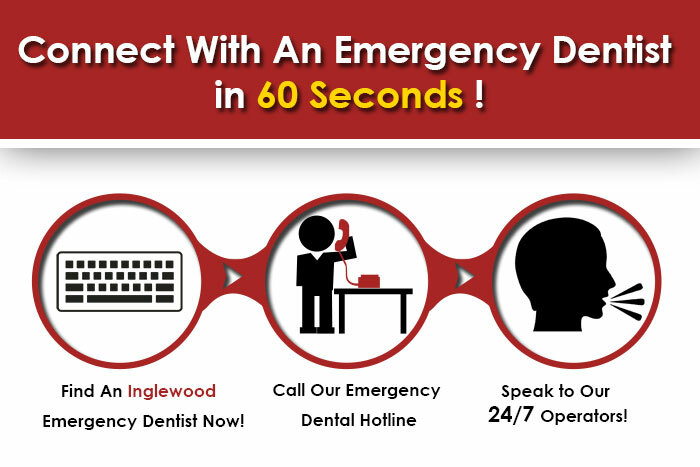 Also if you want to contact an emergency dentist in Los Angeles area, click here. Call at 323 483 7045 to place an appointment with this dental care group, available in several areas in the United States of America. There happens to be a branch of this dental care center in Inglewood too. Their expertise includes digital x-rays, oral exams, oral surgeries and even gum disease treatments. Western Dental is open from Mondays to Fridays, from 9.00 a.m. to 7.00 p.m. On Saturdays, they are open from 8.00 a.m. to 4.30 p.m., which is helpful for all those who are too busy during the weekdays. This dental care unit is open from Mondays to Thursdays, from 9.00 a.m. to 6.00 p.m. On Fridays and Saturdays, all those who cannot visit during the weekdays could drop by the center at any time between 9.00 a.m. and 5.00 p.m. The staff of this dental care center is helpful, always ready to clear out your doubts. The dentists provide with impressive service, making sure to let you know where the problem lies and what your options are when it comes to the treatment of that problem.A ton of children have visited the LAX Dental and Orthodontics, receiving top-class services that gave them clean and healthy teeth. A team of specialists that are experts when it comes to cosmetic and family dentistry, the Ballenger Dental Care center is just an appointment away for all Inglewood residents. All you have to do is place a call at 310 412 2994. Their website is dedicated to holding a stash of pictures of happy patients, old and new. This dental care unit is godsend, accepting bothevening and emergency appointments, whether or not you are an old patient. Their website has an application form, alongside information on what you could do if you have a lack of insurance to cover your dental check-ups and procedures. Click here to find more about Cerritos emergency dentists.